Frags and Beer started out as a personal blog to just write about whatever geek interest we felt like covering. Recently we’ve been working to change the theme, style and format of the site, but didn’t really have a set goal in mind. Then with rumblings through the gaming community showing a large portion of the community looking for something better, we believe have found our direction. Frags and Beer is a non-profit, community geekology webzine. We’ll still cover just about anything geek, but we’ll also work to promote other sites that have shown they uphold a standard of coverage, writing, and ethics that we share. Most of what we cover will be very opinion/editorial based, but we will strive to give our readers the best information possible, or share our interests with the sort of thoughtfulness, and enthusiasm our readers expect. So we hope you enjoy the site, look around, check out our friends, and come back to see what’s new. Julibelle was done for us by the talented Sarah Salanica as she’s known on Twitter and Tumblr. I’ve always had a deep interest in WWII history, and the generation of art that came out of it. WWII aviation, especially bombers, were of special interest and the nose art on those bombers was always so creative, colorful and interesting. 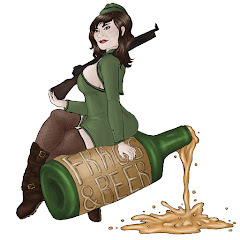 So that’s the inspiration behind our mascot, with Sarah’s unique touch we have Julibelle riding a beer bottle (rather than a bomb) and sporting her Thompson SMG.